Son of Konsert frá Hofi (8.72) and Mánadís frá Nýjabæ. Konsert is the highest assessed 4 year old stallion in the world. Mozart frá Heimahaga is very beautiful and promising young stallion, son of Konsert frá Hofi (8.72) and Mánadís frá Nýjabæ. 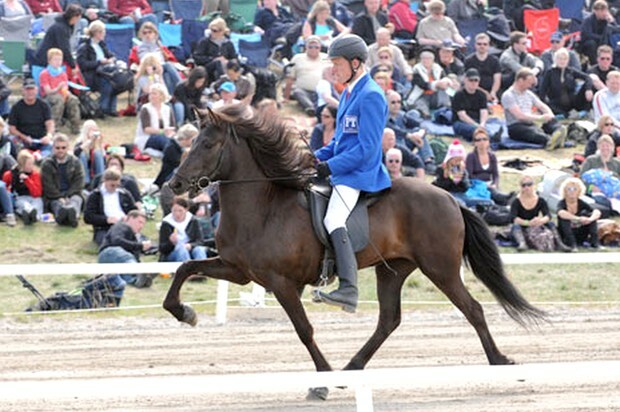 Konsert frá Hofi (8.72) is the highest assessed stallion, at age of four, in he world. 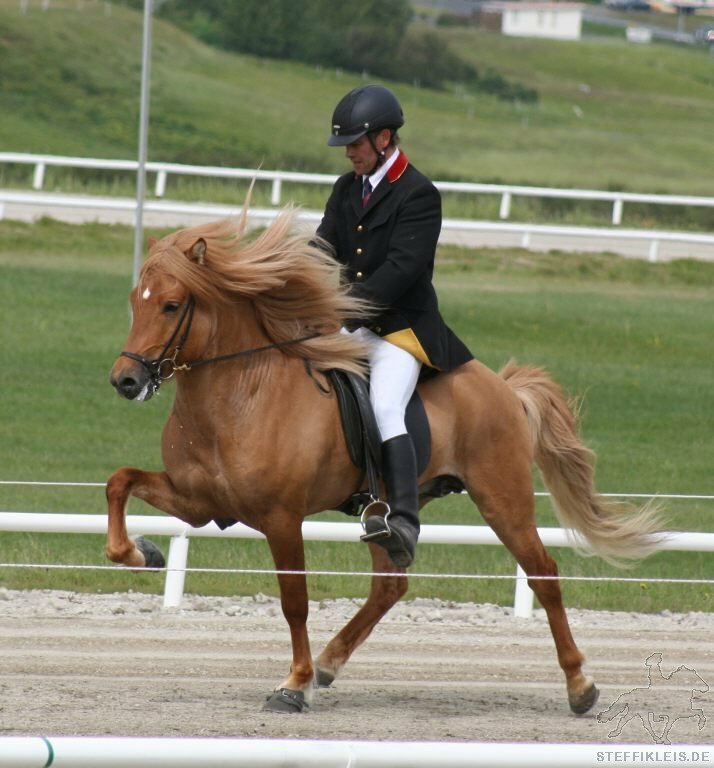 He is also the only stallion at age of four that has got 10 for tölt. 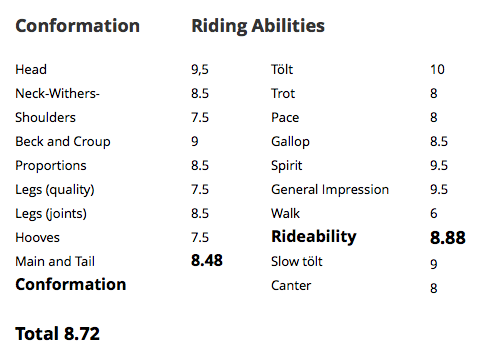 Konsert is dark red dun with a star, he has 8.47 for Conformation; 9.5 for head and 9 for proportions, Konsert has 8.88 for Rideability; 10 for tölt, 8 for trot, 8 for pace, 8.5 for gallop, 9.5 for spirit, 9.5 for general impression and 6 for walk. Konsert has also 9 for slow tölt and 8 for canter. F: Ómur frá Kvistum (8.61) is a dark red dun stallion with a star. He has 8.24 for Conformation and 8.85 for Rideability; 8.5 for tölt, 8 for trot, 9.5 for pace, 8.5 for gallop, 9.5 for spirit, 9 for general impression and 7.5 for walk. Konsert has also 8 for slow tölt and 7.5 for canter. Ómur got 1. price for his offspring at LM2014. 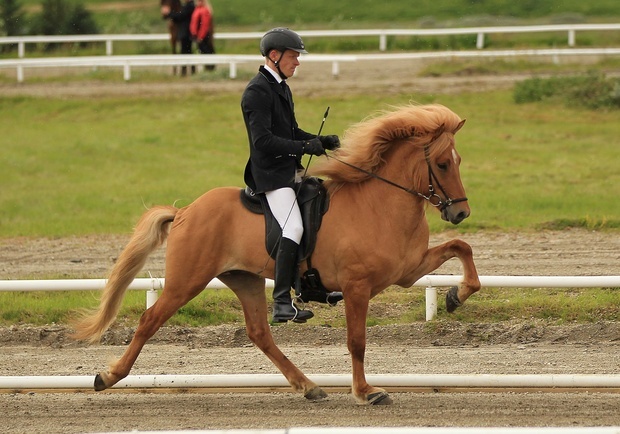 ​FF: Víglundur frá Vestra-Fíflholti (8.06) is a bay dun stallion that has 7.79 for Conformation and 8.23 for Rideability; 8.5 for tölt, 8 for trot, 8 for pace, 8.5 for gallop, 8 for spirit, 8.5 for general impression and 7.5 for walk. Víglundur has also 8.5 for slow tölt. 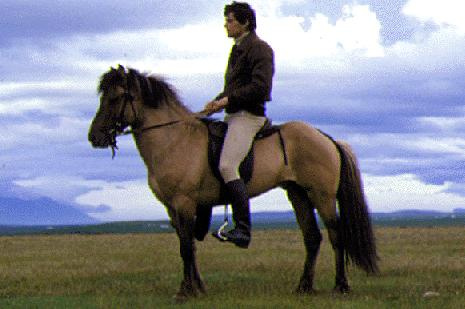 Víglundur is son of the honoured stallion Ófeigur frá Flugumýri. 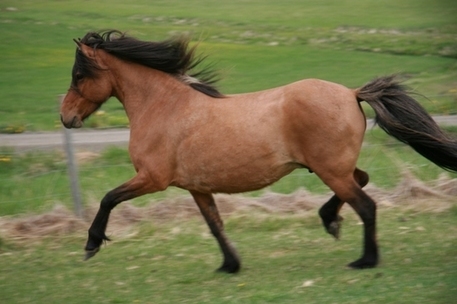 Mánadís frá Nýjabæ is an old and dear breeding mare. She is bay dun with a star. ​F: Ófeigur frá Flugumýri (8.19) an honoured stallion that had 7.86 for Conformation and 8.52 for Rideability; 9 for tölt, 8 for trot, 8.5 for pace, 8.5 for gallop, 8.5 for temperament, 8.5 for character and 8.5 for general impression. Ófeigur got 1. price for his offspring at LM1986 and honorary award for his offspring at LM1990. Ófeigur was dark bay dun. FF: Kolskeggur and FM: Kengála were brother and sister, same mother and same father. M: Fiðla frá Nýjabæ (7.76). 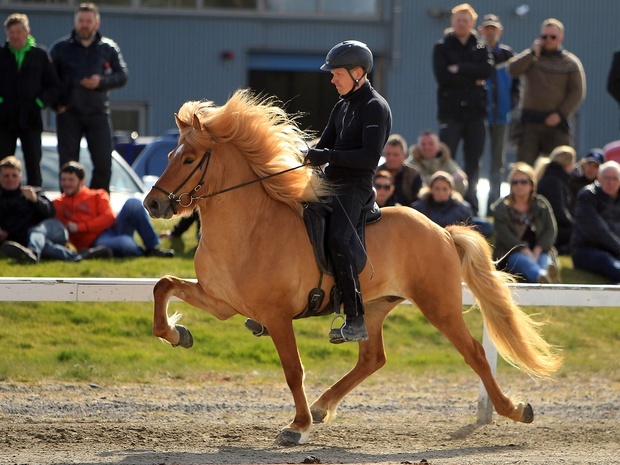 Fiðla has 7.73 for Conformation and 7.80 for Rideability; 8 for tölt, 7.5 for trot, 6 for pace, 8 for gallop, 8 for gallop, 8.5 for temperament, 8 for character and 8.5 for general impression. Fiðla is a light chestnut; sorrel and she has a strong bloodline. MF: Léttir frá Sauðárkróki (8.08). Léttir was a black stallion that had 7.95 for Conformation and 8.21 for Rideability; 8 for tölt, 8 for trot, 8.5 for pace, 8 for gallop, 8.5 for temperament, 8 for character and 8.5 for general impression. Son of the honoured stallion Þáttur frá kirkjubæ (8.16) and the honoured mare, Hrafnkatla frá Sauðárkróki (8.54). MM: Harpa frá Sauðárkróki (7.87). 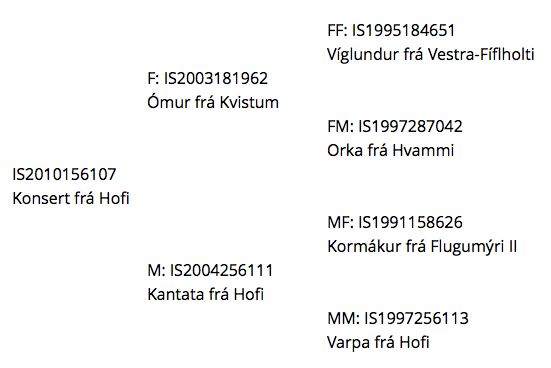 Harpa had 8.20 for Conformation and 7.53 for Rideability; 7 for tölt, 5 for trot 8 for pace, 8 for gallop, 8.5 for temperament, 8 for character and 8 for general impression. 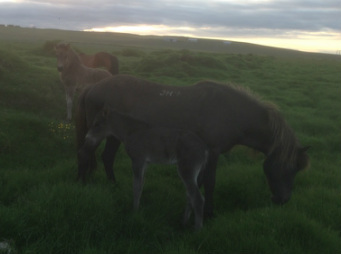 Daughter of Roði frá Eyhildarholti and the honoured mare, Síða frá Sauðárkróki.